FILE - An albino holds a placard during an Albinism awareness campaign in Harare, Zimbabwe, June 18, 2016. "When I was sleeping in my house, four people came and started attacking me with machetes," said Mariama Staford, an albino in Tanzania. "One of those four people was a neighbor, and he is the one who took the machete and was cutting my arms." Staford was 25 years old when she was attacked in 2008. She told VOA that her neighbor first cut off her right arm and threw it to his accomplices. Then, "he chopped off my left arm." "I tried my best to struggle in order to defend myself," she said, "but it was not successful and so they pulled me down in front of my son, who at that time was only two years old." "When I reached there, the doctor who was on duty said that I should be returned home because I was already dead," Staford said. 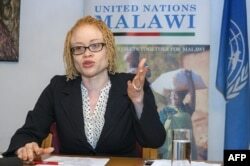 FILE - The U.N.'s independent expert on human rights and albinism, Ikponwosa Ero, addresses a news conference at the end of her official visit to Malawi on April 29, 2016. "Those are reported cases alone. Most cases are not reported because most cases involve family members or people known to the victim," Ero said. "The Red Cross reported that the body parts were valued on the black market. Like an arm was valued at $2,000, and a complete corpse at about $75,000. So, there are profits to be made even though you do not believe in witchcraft," she said. "Societies are afraid of them," Ero said. "The police are afraid of them. So, those are usually not prosecuted. "And then the people on the high scale who are going to pay the money are usually not in jail because they are the elite. Who you find in jail are poor farmers, poor peddlers who are offered a lot of money." "My case reached the trials, and the neighbor that I knew for 10 years was released," she said. "The court said that because I have albinism, I have low vision, so I could not have recognized my neighbor chopping off my arms." "It saddens me to know that, as a mother, I was unable to take care of him, just like a mother would do — even embrace him after the attack," Staford said. "But also, he is a sad person and he always remembers what happened." Staford and her son, who does not have albinism, as well as two siblings — who do have the condition — are living in protective custody in a safe house in Tanzania run by a branch of a Canadian-U.S. charitable organization called Under the Same Sun.